Free Mobile Web App for calculating and displaying Age of the Moon, Phase of the Moon, and Distance from the Moon to the center of Earth. For residents of the Northern Hemisphere, the Southern Hemisphere, and Equator. In the current version you can calculate not only for the current time, but for the past and future days. The “Now” button you can always go back to the calculation of the current time. For the four main Phases of the Moon (New Moon, First Quarter, Full Moon, Last Quarter) displays their names. MoonCalc Mobile Web App uses the W3C Geolocation API (GeoIP), to determine the location of the user to display the current Phase of the Moon. 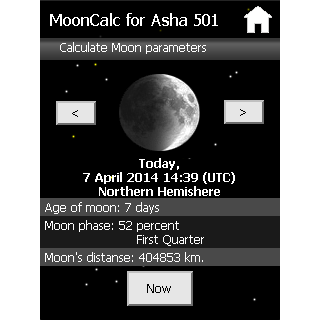 The first release of the S40MoonPhase Web App (the predecessor of MoonCalc Mobile Web App) appeared in November, 2011 for Nokia Series 40 mobile devices. In the period from 2011 to 2014 were created versions of the MoonCalc Mobile Web App for more than 10 different mobile platforms (Nokia S40, Nokia S40FT, Nokia Symbian S60, Nokia Asha Software Platform, Nokia X Software platform, Samsung bada, Samsung Gear, Google Android etc.) that cover dozens of mobile devices. The MoonCalc Mobile Web App became the participant of four international competitions and the winner of the Ukrainian competition for developers. When developing the MoonCalc Web App for Samsung Gear 2 device, our team have been completely revamped design, functionality and mathematical model of the application taking into account specific features of the Samsung Gear 2 device. For example, when displaying the current phase of the Moon instead of the bitmap image on the HTML 5 Canvas formed a vector image. What, in our opinion, is more consistent with the style of design the Samsung Gear 2 device. The MoonCalc Mobile Web App was downloaded more than 100,000 times by users from 186 countries of the whole world. This entry was posted in A.V.T. Software departments, A.V.T. Software products and tagged MoonCalc Android Web App, MoonCalc for Nokia Asha 501, MoonCalc for Nokia X, MoonCalc Gear 2 Web App, MoonCalc Mobile Web App, MoonCalc Mobile Web App Project, MoonCalc Web App, S40MoonCalc Web App, S40MoonPhase Web App, S60MoonCalc Web App. Bookmark the permalink.